Cows don’t eat grass – but the trillions of bacteria living inside each cow’s digestive system do. Okay, I guess I’m being a bit imprecise to say it like this. Perhaps it would be more accurate to say that cows consume the grass (that is, they use their bodies to get the grass into the first of their four stomachs), but it’s the bacteria inside the cow that are then really responsible for breaking down the grass and thereby releasing energy, protein and micronutrients for the cow to use so she can continue her mooing. I understand that this subject is not directly related to WFPBD or human nutrition in general, but the facts about how cows are able to grow so big by just chomping on the green stuff is so fascinating that I simply had to share it with you. And, it could be argued that there is a sort of link up with plant-based diets; after all, we humans exist within the spectrum of creatures that are either totally carnivorous on the one hand, or completely herbivorous on the other. Arguments abound about our precise location within that spectrum, but there’s no doubt about where our bovine brethren and other similar ruminants 1 reside. The cud is described as: “…a portion of food that returns from a ruminant’s stomach to the mouth to be chewed for the second time. 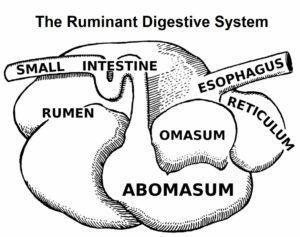 More accurately, it is a bolus of semi-degraded food regurgitated from the reticulorumen of a ruminant. Cud is produced during the physical digestive process of rumination” 6 . 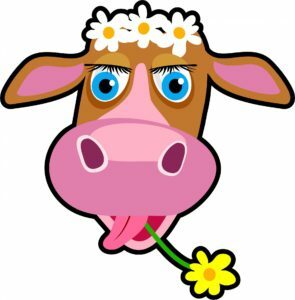 So “chewing the cud” is really a process of rechewing the cud to further break down the plant matter and stimulate digestion. This is called ‘rumination‘, and hey presto! that’s why they are called ruminants. 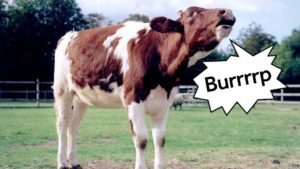 The word “ruminant” actually derives from the Latin ruminare, which not surprisingly means “to chew over again”. 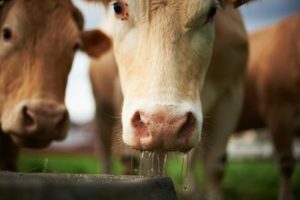 When a ruminant eats grass, the grass is chewed and swallowed and mixed with saliva – and if you’ve ever watched a cow eat, you’ll know that they are particularly good at producing a lot of saliva. This is necessary since the acidity of the digestive fluids in the rumen (the virtual ‘fermentation tank’ where the grass and hay first goes) needs to be offset by the alkalinity of the saliva. This keeps the pH in the right range for fermentation to take place. The new hay and grasses float in the middle of the Rumen with the gasses floating to the top and the older grasses and hay sinking down. The gooey mass travels through the oesophagus and into the rumen. The rumen acts as a fermentation tank since huge quantities of bacteria 7 , protozoa 8 , methanogens 9 and fungi 10 reside in the rumen. These microbes 11 love the anaerobic 12 environment therein, and so create conditions that allow plant matter to be digested without ever rotting as it would if it were in an aerobic environment. The grass entering the cow’s digestive system is not really feeding the cow, it’s feeding these microbes which need the nutrients in order to survive. They, in turn, provide their host, the cow, with the nutrition she needs. This is a mutually-beneficial relationship since both the microorganisms and the cow benefit and complement each other. Bacteria produce enzymes 13 to break down the cellulose and hemicellulose 14 in the plant material, which is called cellulase 15 . The microorganisms do this to release the nutrients contained therein so that they can survive and produce the next generation of microbial life. As the bacteria digest the plant matter, they produce by-products including VFAs (volatile fatty acids) 16 , carbon dioxide and methane. The latter two gases get eructated (burped) out the cow’s mouth. The VFAs get absorbed into the bloodstream or carried along into the omasum and abomasum for further digestion. VFAs are produced from the digestion of starch 17 , lipids 18 and fibre 19 into simple sugars 20 , which in turn get converted to VFAs. 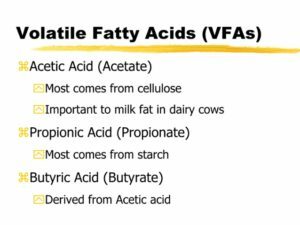 The VFAs are made available by the microbes to the cow as an energy source. The amount of energy made available to the cow does though depend on the energy content of what the cow is eating. 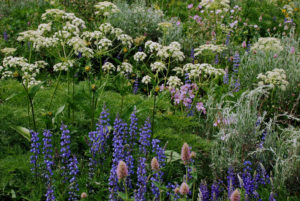 Leaving aside the contentious issue of modern cattle feed (stuff like soya, other grains and even chicken manure), the natural forage that cows eat, in addition to a wide variety of natural grasses, include legumes like alfalfa, trefoil, milkvetch, clover, sanfoin and others. which provide a better source of protein than grass alone and are often included in the range of pastures and hay. Grain, by the way isn’t as good a protein source since it’s more starch than protein. If the forage has a high energy content, then the microbes get lots of energy and there’ll be some left over for the cow herself. However, if there’s low energy (starch) and high fibre, there’s less remaining energy available even if the cellulose-digesting bacteria can derive plenty of energy for themselves from the cellulose. Cellulose is more fibre than energy, compared with starchy sources. This means that if a cow eats too much fibrous forage with insufficient starch, she could actually starve to death. Cows get their protein is from two main sources: digesting the microbes themselves (as microbial protein), and from the plant sources (as by-pass protein). 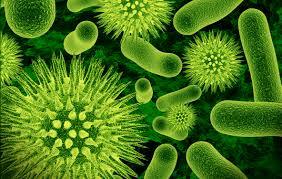 Surprisingly enough, microbes (dead or still alive) provide the cow with 40% of her protein sources. The microbes only live for around 15 minutes, so as the plant material from the rumen moves through the rest of the digestive tract, most microbes that go along for the ride are dead, with some still clinging on to life before being digested and used as a protein source. The plant protein that the microbes don’t digest themselves (and, of course, microbes need protein too), will pass through to the omasum and onwards, or get absorbed into the bloodstream. Too much protein and it will passed out in urine and faeces; too little and she could become deficient. Protein deficiency will tend to cause the cow to search for other sources of food which are perceived as protein, such as salt and phosphorus. Fat requirements are not as important to cows as are requirements for energy and protein. This is because they already have a source of fatty acids derived from the microbial digestive process occurring in the rumen. Salt can often be deficient in a cow’s diet. Grass doesn’t give all the nutrients to a cow. A vegetarian diet is low in sodium when compared with an omnivore’s or carnivore’s diet. Salt (sodium chloride) is essential for their bodily requirements (osmosis 25 and other cellular functions). Soil can also be deficient in other minerals that the cow requires in small quantities, such as sulphur, selenium, iodine, cobalt, copper, etc. Modern soils can be bleached out through overproduction. Additionally, cows may be forced to live in low-mineral areas where they wouldn’t naturally decide to live if they were left to roam free and decide for themselves where they wanted to live. This means that supplementation with a mineral/trace-mineral salt block is usually necessary to prevent mineral deficiencies. Grasses and forbs 26 don’t maintain the same nutrient level throughout seasons. A plant’s most nutritious stage is often just before flowering or the emergence of the inflorescence 27 . This is when they are mostly water. A plant’s least nutritious stage is at emergence and still below a height of 10 inches, and also when they have gone into dormancy. This is when they are mostly fibre. Well, not strictly true – but they do often swallow metal objects (such as nails or wire) when foraging, and farmers sometimes make cows swallow magnets. But why? 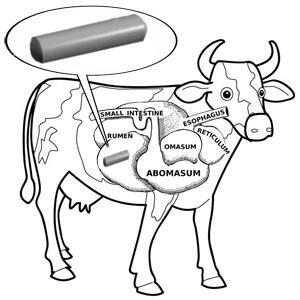 When any ruminant swallows metal, it sinks into the reticulum. 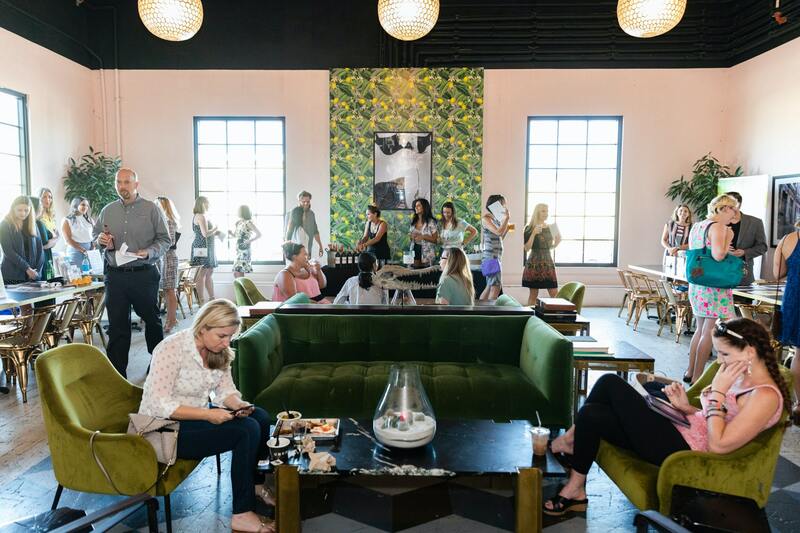 There it can move onwards or, while still in the reticulum, penetrate the lining and cause a condition called hardware disease 28 . Farmers often ‘feed’ a magnet to their cow because it helps to hold any metal bits safely together in one place, reducing the risk of the above condition.